Nicholas Kahn and Richard Selesnick’s show “Eisbergfreistadt” at Pepper Gallery spins a tall tale of a giant iceberg, loosed by “heat from factory smoke,” that ran aground in a German port in 1923. As they imagine the story, chamber of commerce types declared it a free trade zone – the Iceberg Free State of the title – and currency called notgeld was issued. The iceberg became a tourist destination. 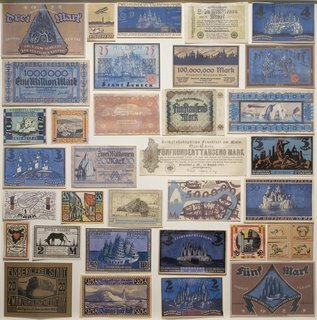 It inspired artists to utopian city planning, and their designs were reproduced on the currency, which inflation made worthless. The iceberg broke in two during a masked ball. Half melted. The rest drifted back to the arctic, with revelers stranded on its icy hills. And so on. 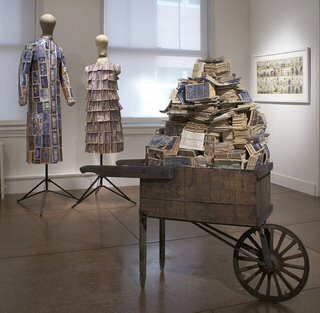 Kahn, who lives in Brooklyn, and Selesnick, who resides in upstate New York, met while studying at Washington University in St. Louis, where they both received BFAs in 1986. They’ve both spent time on Cape Cod over the years. Kahn and Selesnick have collaborated for two decades. Recent projects have imagined a journey to the moon where astronauts found stranded Edwardian space explores and an Indiana Jones-type of adventure in Middle Eastern deserts. 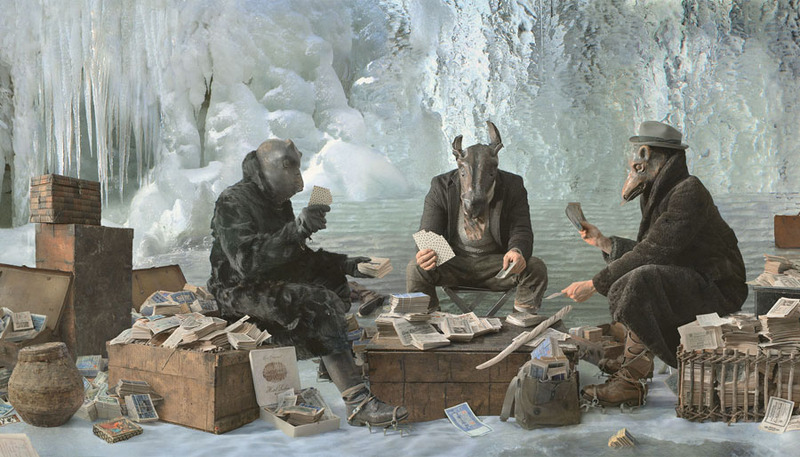 Here Kahn and Selesnick’s three main panoramic color pictures, which appear to be a concocted from Photoshopped photos and watercolor matte paintings, give glimpses of what happened after the iceberg floated back to the frozen North. A guy in a polar bear-coat paddles a snakeskin kayak over ice. Men in fur coats and animal masks play cards for heaps of worthless currency inside an iceberg cavern. Rescuers arrive via sea plane and dig out a man frozen beneath the ice. In the gallery stands an actual wooden wheelbarrow piled high with bundles of the “worthless currency,” and a man’s coat and woman’s dress made from the bills. Black and white photos depict a massive iceberg rising behind the steeples of a town, a seaplane perched on the ice, ladies burning cash in a fireplace. “Eisbergfreistadt” is an elaborate allegory about global warming and the follies of capitalism, tourism and art. It plays fun philosophical games about “worthless” money that is actually art and thus not so worthless. The wheelbarrow full of the stuff is priced at $20,000. The story could be an outtake from Michael Chabon’s new novel “The Yiddish Policeman’s Union,” a murder mystery set in an imagined teeming Jewish safe haven in Alaska. The stagy pictures look like Edward Gorey on ice. It’s amusing, but all the showy intellectual gymnastics wind up feeling forced. Kahn/Selesnick “Eisbergfreistadt,” Pepper Gallery, 38 Newbury St., Boston, May 4 to June 9, 2007. Pictured from top to bottom: Detail of “Seeflashe (Sea Plane)”; whole “Seeflashe (Sea Plane)”; “Notgeld Ansammlung (Notgeld Collection)”; installation shot of “Mantel Notgeld der Manner (Men’s Notgeld Coat),” “Notgeld Kleid (Notgeld Dress),” RadfaB (Wheelbarrow),” and Kartenstapeles (Deck of Cards); detail of “Kartenspeil (Card Game)”; and “Schlangeboot (Snake Boat),” all 2007. I liked the show but it's a shame that more care wasn't taken with the digital editing. The Photoshopping feels sloppy. In fact the pictures themselves seem a little hokey, I guess all those random objects are supposed to feel like clues to some mysterious narrative but for me it all adds up to a lackluster Wes Anderson-like excercise. I think the show really shines though in the more craft based aspects, those dresses really are great, and the playing cards, though I could do without the heavy-handed "house of cards" title, are really interesting. The woman behind the desk told me that the boat from one of the images was real; I'm amazed they didn't include it in the show. Overall, I would have liked something that focused less on narrative and more on doing interesting things with the "artifacts."